Doctors and clinics all over the world are recommending the ReBuilder Neuropathy Treatment System. Fast, safe, effective, proven! The Rebuilder… 94% effective treatment of the chronic pain of Peripheral Neuropathy. 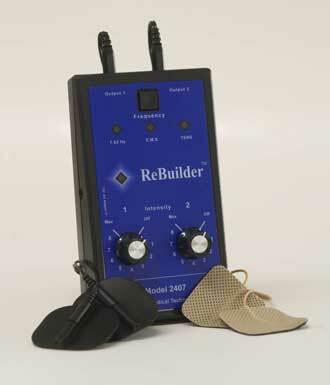 The ReBuilder is a proven and doctor recommended electronic, peripheral neuropathy treatment. It is medication-free pain relief. It consists of a small, hand-held stimulator that send a comfortable kick-start signal to your feet, legs, arms and hand that can get your nerves functioning again. You can think of it like a defibrillator that gets your heart working again but the ReBuilder feels good. The ReBuilder analyzes the waveform of your nerves, determines any abnormalities, creates the unique healing signal necessary, administers it, and then re-evaluates the result. This process happens 7.83 times every second.